Jinshan, near Hangzhou Bay, has three islands which have suffered almost no human interference: unpolluted areas, home to numerous plants and animals, which are no longer found in Shanghai. It also has rich farmland, making it Shanghai’s major source of fresh food ingredients. Jinshan is the centre of Shanghai’s chemical industry, with the massive Shanghai Petrochemical Company and Shanghai Chemical Industrial Park. Jinshan only has one major residential area. 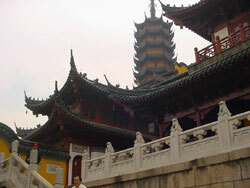 Yet it offers much for visitors, with five great, centuries-old Buddhist temples. Jinshan is also known for its modern folk paintings and pottery, celebrated yearly in its Annual Tourist Festival.